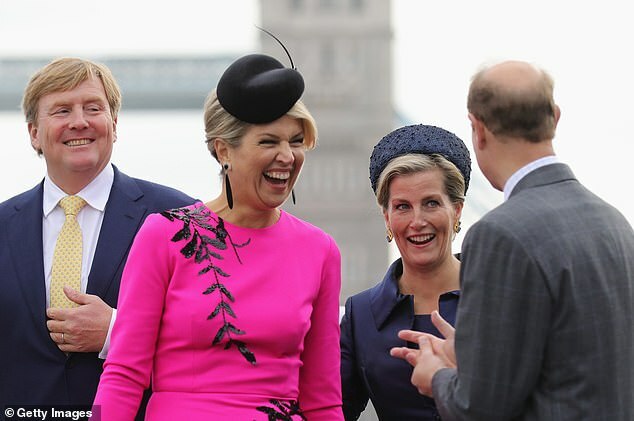 My first "real" post here to confess my girl crush for Queen Maxima... and I have enjoyed this love fest thread so much :-) Sophie and Maxima are among my favorite royals and they really get along well - you can't fake those smiles. 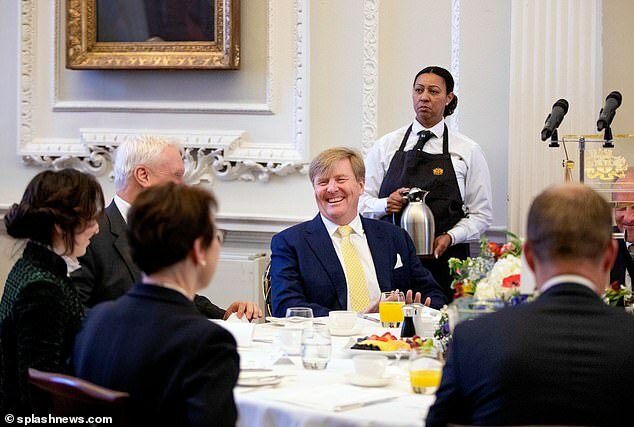 I think that King Willem Alexander is enormously proud of his wife, he has this happy little smile in his eyes when he looks at her. Perfect. What a wonderful royal visit. And following along here with all you knowledgeable people explaining about the bling is just great. Welcome Carreen! Isn't she marvelous, she's my absolute favorite royal lady of the younger generation. She is so confident and comfortable in her job that she has helped other royal ladies gain or maintain their footing (CP Masako of Japan for example). And she does it with panache and a smile on her face. A truly great lady. 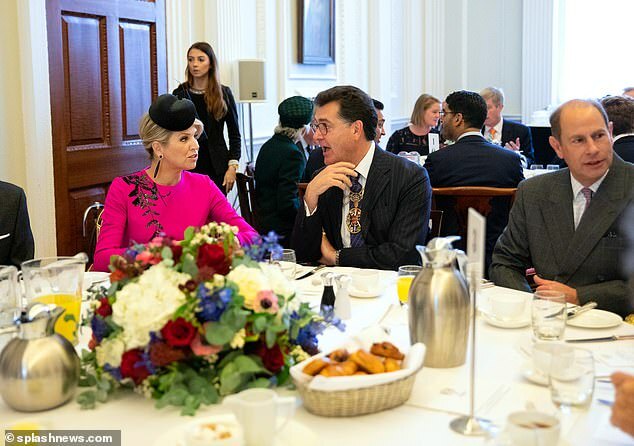 Im glad to see Kate wearing jewels from the family vaults like that necklace, bracelet etc, and that she is not just wearing peices from Diana, its enough with the big blue and the tiara. 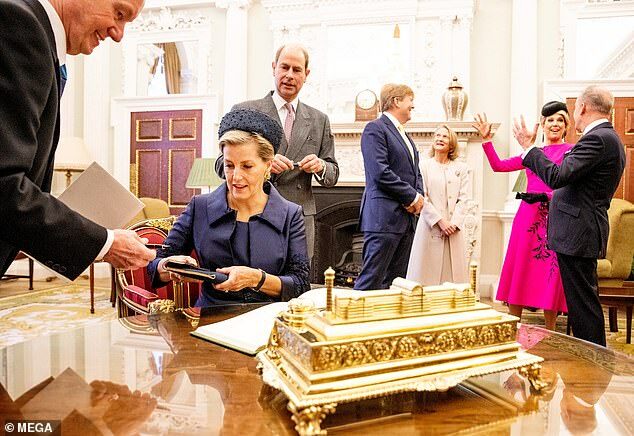 Seems Queen Elizabeth has become rather generous with jewels from the vault now, Im no specialist on Dianas Jewels but it seemed much were private jewellery and gifts from the Saudis etc, and Sara hardly anything historic? 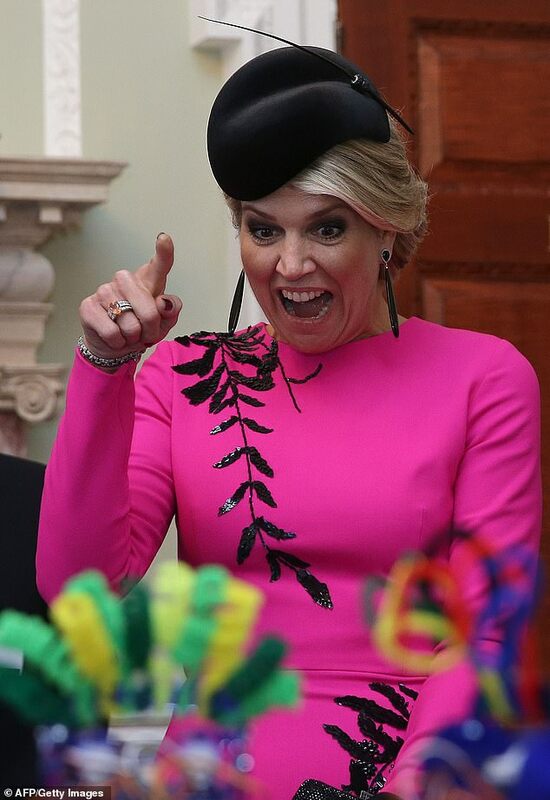 And thenshe supprised with the not seen for long tiaras of Eugenie and Meghan for their weddings. Kates dress though..I cant belive a used to be avant guard and fashion forward label like McQueen made that promqueen dress, what a bore. Maxima really pulled of that diamond wall,cant say I find it particularily pretty, but it is impressive and historic and nice to see with todays photoquality. I feel the brooch on the middle of the stomackhlooks like it has slid down, and would be better higher up on the sash, but personal taste really. A pitty there were no second banquet like there often is. Have never followed her much, but have fallen in love with Maxima during this trip. She's everything modern royalty should aspire to be, and obviously a very nice and fun person as well. She looks regal, without looking the least bit snobby or pretentious. And, doesn't look as if she'd rather be anywhere else, doing anything else, as so many of them do. Isn't there usually a Return Banquet/Dinner hosted by the guests? I remember WA & Max hosting one during their Danish state visit. At any rate, an extremely well-organized and successful State Visit...short but memorable. Everybody looked dignified! 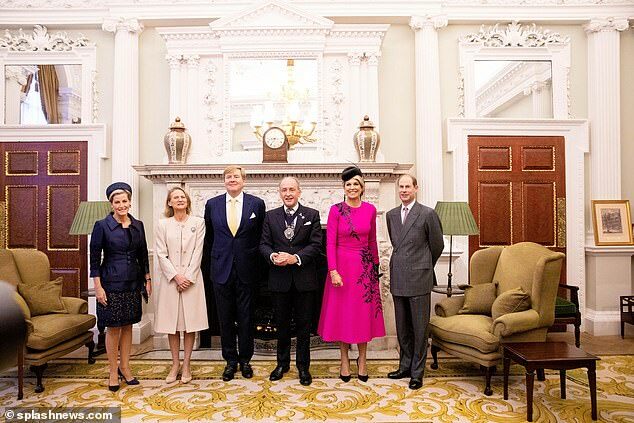 The Dutch Royals accomplished a lot including a speech before the Parliament. It will probably be another 40 years before we see one between these 2 countries. I agree with all how well WA, Max, Ed and Sophie get along. Shouldn't the Cambridges learn and network? If there is one couple who can 'guide' them it's WA and Max. Kate had lunch with WA once, when she was in the Netherlands. And didn't Kate do trooping once next to Max? Age gaps should not matter at this level of professionalism and diplomacy. Liz and Bea are close from the start, while Liz is 10 years older. For my fellow Dutchies here: when did WA become so handsome, non awkward and charming? Who is this dashing man? I like! A lot! 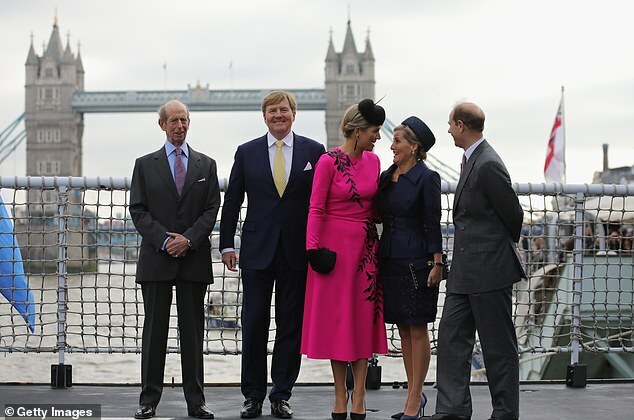 Looks like the Duke of Kent was there on the bridge too! Well I guess Philip is sick and so maybe QM wanted to be with him or the walking around was too much for her? I get the feeling Sophie is the go-to royal. 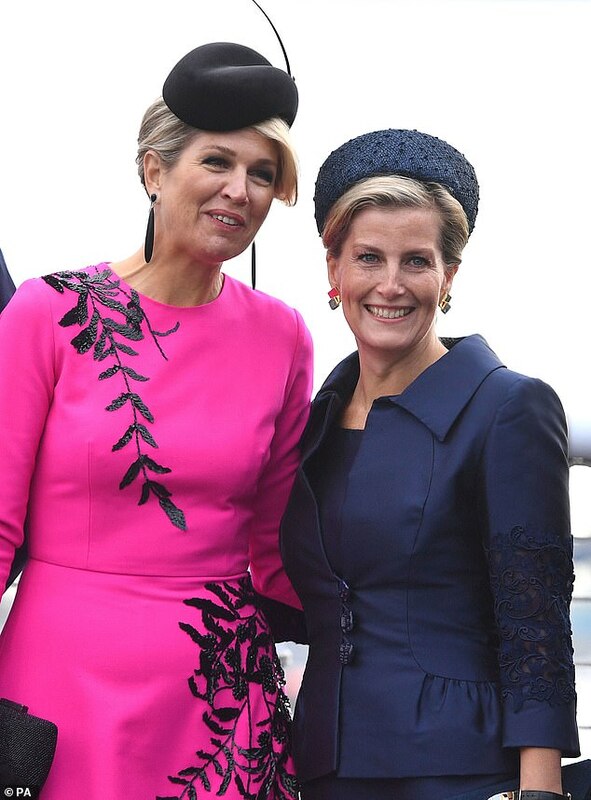 She and Maxima appear to have a great rapport. Agree that Charles should have stepped up as the future king, but who knows, maybe the Dutch royals requested Sophie & Edward? Great to see the Duke of Kent there. Yes - the bling on her in the State Dinner occasion was wonderful. She was "the Queen". The pink dress - not so much for me but I guess it was "Max". If that dress is Natan then I rest my case . . . .
No, it's said to be Oscar de la Renta.